SPRINGFIELD, Mo. — Republican U.S. Senate candidate Todd Akin said Democratic incumbent Claire McCaskill has fetched expansive government policies “like a dog” during her tenure in Washington. The remark was another in a series of quotes that could place more distance between Akin and female voters. Earlier this year, Akin questioned whether McCaskill was “lady-like” during their first debate, and during their second debate was criticized by McCaskill for his opposition to “equal pay” laws for women. 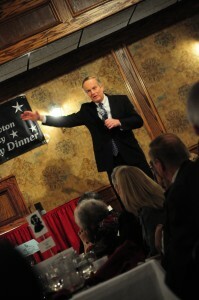 Akin, speaking to the audience Saturday evening, said the focus on issues other than the economy is a “distraction” by the McCaskill campaign from her tenure in office, and encouraged voter to compare her six years as a senator with his 12 years in the House.